Gluten is made from 100% Gluten (which is the protein found in flour) and is a low carb flour. It is also high in protein and low starch and is suitable for Vegans and Vegetarians. It has a light cream colour which is made by drying freshly prepared wet gluten seperately from other wheat flours. It is perfect when used to make light breads and to increase the elasticity in baking. It will also add more protein when mixed with regular wheat flour. This plain/all purpose flour is completely gluten and wheat free and is made from specially selected natural ingredients. It has been developed with similar functional properties to ordinary wheat flour to ensure it can be easily used in most recipes including baking and batters. 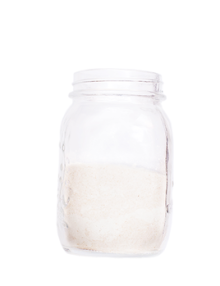 Arrowroot Flour, also know as Tapioca Starch is made from ground up Cassava root. It can be added to baking and sauces and acts as a thickener to help bind together ingredients. It can also be used in both gluten free and paleo recipes. Besan flour, also know as Gram flour, is made from ground chickpeas which is what gives it it’s yellow colour. It is gluten free and low in saturated fats, cholesterol and sodium. Besan flour is also very high in protein and rich in nutrients such as magnesium, copper, folate and manganese. It is mostly used in Indian cooking but can be added to most recipes as an alternative to ordinary wheat flour including breads, muffins, cakes etc. It can also be used as a thickener in gravies and sauces and used to bind vegetable fritters and falafels.